Moneyfields are looking for a new chairman after Paul Gregory’s decision to resign. After long discussions with the Southern League division one south club, he decided it was time to step down. Increasing work commitments have left Gregory no longer able to put in the time and effort necessary to take the club forward. A club statement said: ‘Paul, in his time as chairman, has guided the club to its first promotion into the Southern League. ‘We are also on the brink of obtaining an historic planning permission for the club which, if granted, would secure its long-term future. ‘This has been something which has always been our chairman’s goal. ‘In his time at the club, Paul has also been instrumental in setting up the successful youth system which is benefiting lots of youngsters in the local area. ‘Many of them move on to play for the senior sides. Moneyfields have appointed Pete Seiden as temporary chairman while they look for a new leader. Meanwhile, Horndean needed a late show to earn a 3-2 Wessex League premier division victory over Team Solent at Five Heads Park on Tuesday night. The hosts hit the crossbar as they threatened to break the deadlock after 15 minutes. Three minutes before the interval home keeper Kieran Magee kept his side on level terms with a good save from a long-range shot. The woodwork then denied the Deans for the second time on 65 minutes as another shot bounced back off the crossbar. And it was Solent who broke the deadlock three minutes later. However, Horndean responded immediately with Harry Jackson levelling within 60 seconds. Solent regained the lead on 73 minutes following a deflected strike. 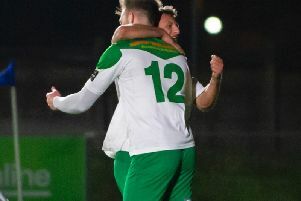 But late goals from Jackson – his second of the game – and Liam Kimber turned the match on its head and earned the Deans all three points. Baffins Milton Rovers romped to an 8-0 win over Fleetlands in the Portsmouth Senior Cup at the PMC Stadium. In Wessex League division one, United Services won 4-0 at Andover Town. Tom Jeffes netted in each half after Harry Potter had opened the scoring. James Franklin was also on target.